A while back I wrote a post about what I thought about drawing with a mouse or on a trackpad (spoiler: it's like drawing with a bar of soap). Since then, we've received a lot of requests from our users to what styluses we like, especially for a collaborative online whiteboard like Limnu. Since we regularly test Limnu on a whole pile of devices with a wide variety of styluses, I thought I'd start a series of blog posts talking about what we've learned. This first post covers two styluses. 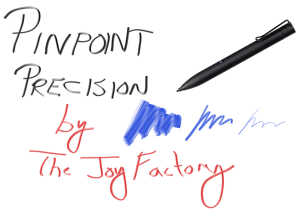 The first is the Pinpoint Precision Stylus (3rd Gen) , made by The Joy Factory. It's powered by a AAA battery, but doesn't use anything like Bluetooth to communicate with the tablet. Instead, the battery power is used to generate a field around the tip of the stylus that the tablet interprets as a finger. This might sound weird, but it's actually pretty cool, because you don't have to "pair" your the stylus with the tablet or install any special software. You just turn the stylus on and you're good to go. It also means that the Pinpoint can work with a much wider variety of touch screens than many Bluetooth-based styluses. The fine point on the tip is great for being able to see what you're drawing – this is why styluses are so much better than fingers on touch screens. However, the tip doesn't do the drawing, it's that field around the tip. So if you hold the stylus at an angle (and who doesn't? ), the tip may not quite line up with where the tablet actually draws. It's not a deal breaker, because if you're drawing fast you'll never notice it. And if you're using Limnu as a brainstorming tool, you're drawing fast. The Pinpoint isn't the only stylus that uses this field technology. (In fact, we'll be covering some other styluses that do the same thing in some future posts.) But the Pinpoint implements it well; better than most. One more thing about the tip: it glides very smoothly on the glass of a tablet. This might be what you want, or you might want a stylus that has a little more friction so it feels like rougher paper. It's a personal preference thing, and the Pinpoint leans towards less friction. The Pinpoint is a little heavier and has a wider diameter than most of the styluses I've used. For people with smaller hands, this might become tiring after a while. Alternately, people with bigger hands may appreciate that. I do enjoy using the Pinpoint quite a bit. It's one of the better field-generating styluses I've tried. Like the other styluses in that category, it works on a wide variety of tablets, phones, and other touch screens. The other stylus I reviewed for this post is the Solo by Sensū. Calling the Solo a stylus isn't really doing it justice. It looks and feels like a paintbrush. In fact, it IS a paintbrush. There's no battery; instead, Sensū applies a process to the brush hairs to make them conductive in a way that capacitive touch screens respond to. I don't use my Solo for taking notes for the same reason that I wouldn't take a canvas, brush, and palette to a physics lecture: it's the wrong tool for the job. But for an art class? Absolutely. Check out Sensū's gallery and you'll see what the Solo can do. 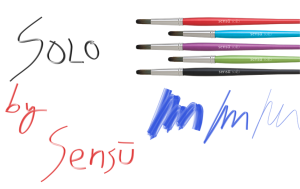 In many ways, what Sensū is doing with their brush/styluses is what we're doing with Limnu. We take the best things from a traditional whiteboard and combine them with all the advantages that modern technologies give us. UPDATE: Sensū got back to me; thanks, guys! The Buddy doesn't fit on the Solo... and the more I think about it, the more sense that makes. The Solo has a really nice balance in my hand, and I'd hate to mess with that. Both Joy Factory's Pinpoint Precision Stylus and Sensū's Solo are great tools for touch screens. Which one you pick is really dependent on what kind of work you're doing. I love my Solo, but I tend to use it with painting apps, not with Limnu. The Pinpoint is great for Limnu, but personally I find it a little too heavy. If you're ok with the weight, then get the Pinpoint. If not, there's another stylus using the same field-generating technology that I'm going to review in a future post that you might like more... so stay tuned!